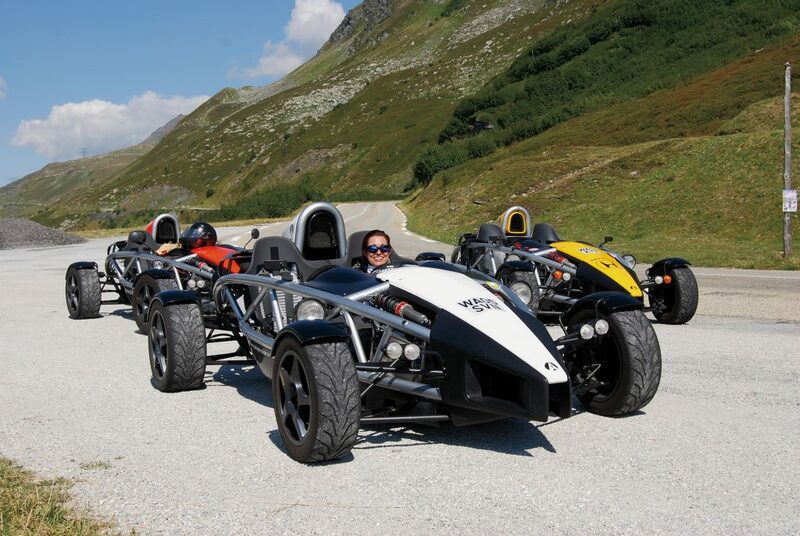 If you’ve got an Ariel Atom or Nomad, you really must take it to some of Europe’s best driving roads. Routes you’ve seen on BBC Top Gear or in magazines like Evo. So we’re going to tempt you with the experience gathered by a few owners that travel afar on a regular basis. This isn’t an exhaustive guide to touring Europe – it’s an explanation of why owners go and what to consider if it’s something you’ve always wanted to do. It’s a personal take on using your car for serious fun and sharing the thrills with other owners. ’, get out your road atlas and book that channel crossing. It’s advice we’d give to any Atom or Nomad owner that’s wondering if their car is suited to exploring the continent. You won’t see the Atom or Nomad in any list of recommended grand tourers in the motoring press. It’s no big-engined, luxury barge for hoovering up border crossings or autoroutes and your friends will think you’ve taken a knock on the head when you tell them you’re packing for a drive across the Swiss Alps, but the Atom and Nomad are more suited to touring than you think – if you go with the right attitude. Like any long motorcycle trip, going to the continent is about taking just the essentials and driving some of the most thrilling and empty asphalt that you can find. It’s an overused word, but these are addictive roads and they pull people back, year after year. Fast tarmac that snakes through sleepy, rural France; passes that climb up one side of a mountain and down the other – where you feel the temperature fall as you drive thousands of metres above sea level and snow-capped peaks fill your mirrors. Some of the highest paved roads in Europe can be explored in an Atom or Nomad, with the unfettered field of vision that only a roofless car can give you. Going solo is great, but flying up a mountain pass with friends is ten times better, and the group finds a fast, flowing pace that keeps it exciting. Going in numbers is also safer, because you have your mates to lean on if anything should go wrong. And the Schilthorn? 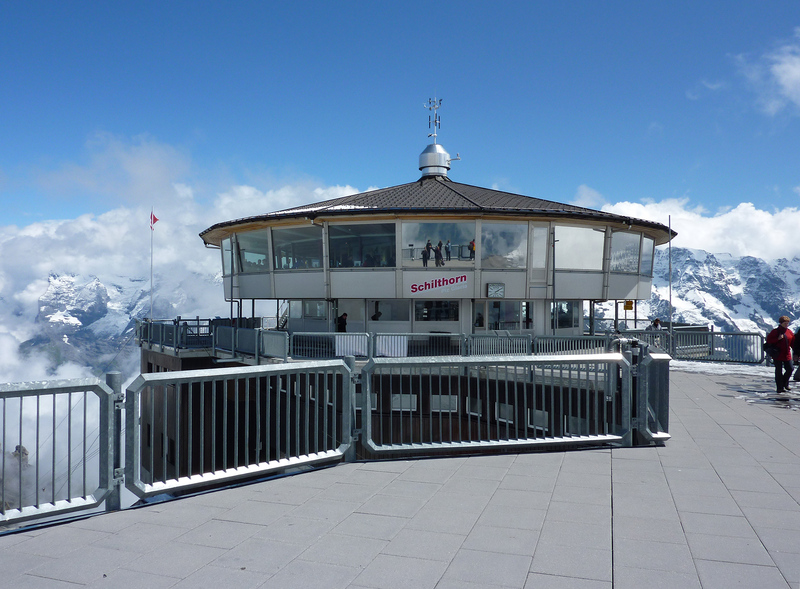 It’s a Swiss mountain summit, with a revolving restaurant, featured in On Her Majesty’s Secret Service and visited by Atom owners in 2010. Most UK Atom owners head for France or Switzerland. Italy has been proposed and one owner has been as far south as Morocco, but most long tours stay within mainland Europe and last about ten days. Brittany and Normandy are popular short trips, with some great country roads to be explored and the Côte d’Azur is still a magnet, taking in the Millau Bridge or the Route Napoleon on the way. Some destinations mean a little motorway driving is needed, or you can add a few hours to the journey and go cross-country, with a relaxed lunch to break up the day. You’ll definitely arrive later, but the journey will have been so much more enjoyable. That said – don’t underestimate the time it takes to go the twisty way! 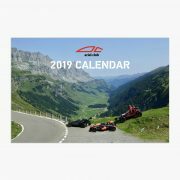 By late 2017, there had been three organised trips to the Swiss Alps, two to northern Spain, two to the Pyrenees, two to Monaco (one grand prix) and numerous long-weekenders in northern France. Most trips occur in the warmer months of June, July or August, when the mountain passes are open and rain is less prevalent. Although we’ve had 20 degrees celsius in Normandy in late October. 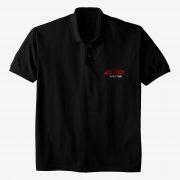 The ambient temperatures mean that you can drive in a t-shirt or lightweight jacket during daylight hours. If you’re travelling some of the mountain passes at altitude it can get very cool and you’ll want to slip another layer on. 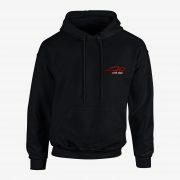 Come nightfall, the passes can get cold and you’ll need your thermal gear to stay in the driving seat, although you really should be slumped in a hotel bar by the time it’s dark. After covering a fair few miles, if you’re in any doubt, fill up. Petrol stations can be rare on some routes so it’s a long walk to the nearest pump. Don’t forget to rehydrate your brain, too. Some of the mountain passes we’ll mention below demand your full concentration. 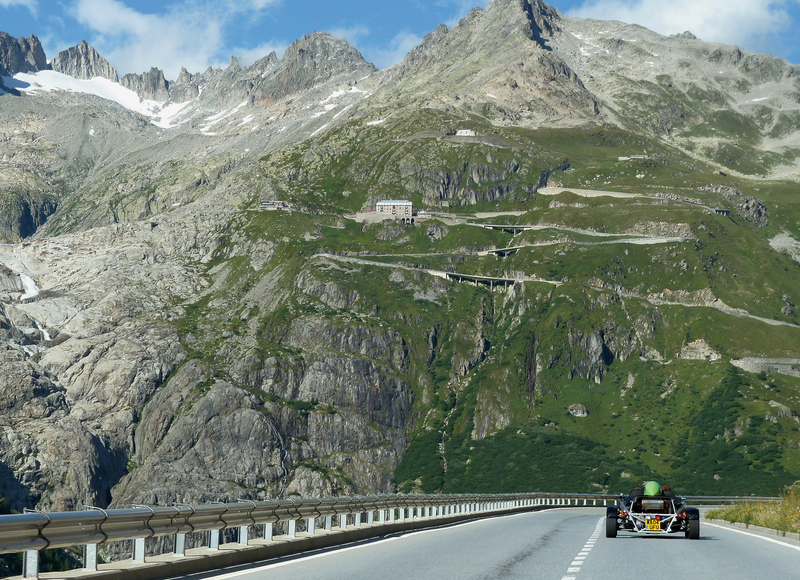 Switzerland is a mountain pass paradise if you’re an Atom driver. The roads can be empty, smooth and very challenging and you’ll want to stop frequently to take in the breathtaking view. They are, without doubt, dangerous in places, but that’s one of the reasons we go – for the thrill of it. You don’t buy an Atom to drive to Sainsburys, right? 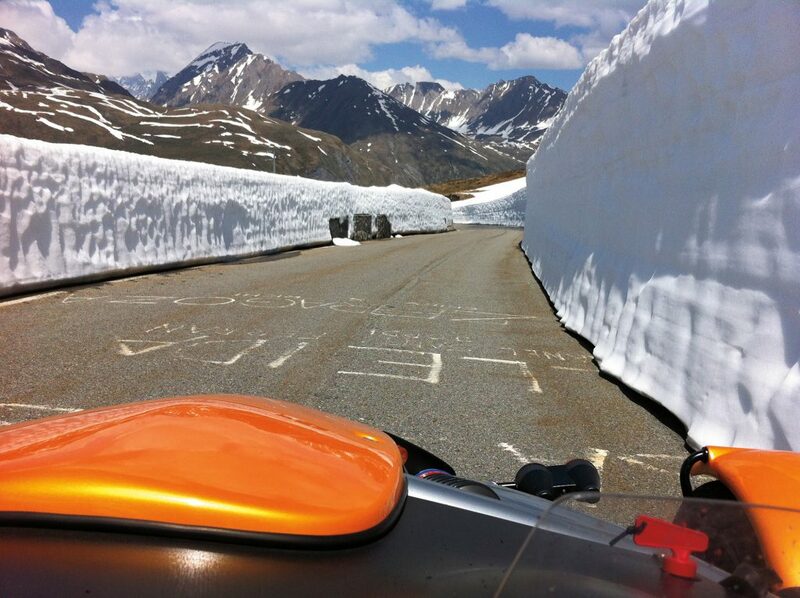 Descending a wriggling Alpine pass in an Atom is much more intense than tackling it in an enclosed euro-box. It’s more like piloting a go-kart down a tarmac slalom. The delights of France are too numerous to mention, but past trips have been organised to take in the Millau Bridge, the Normandy beaches of D-Day, the battlefields of the Somme, the Route Napoleon and the Côte d’Azur. The French countryside is covered with twisting country roads that are often in superior condition to our UK roads and the density of traffic makes for very fast progress. They also know how to lay roads for overtaking opportunities, which are despatched quickly in an Atom. 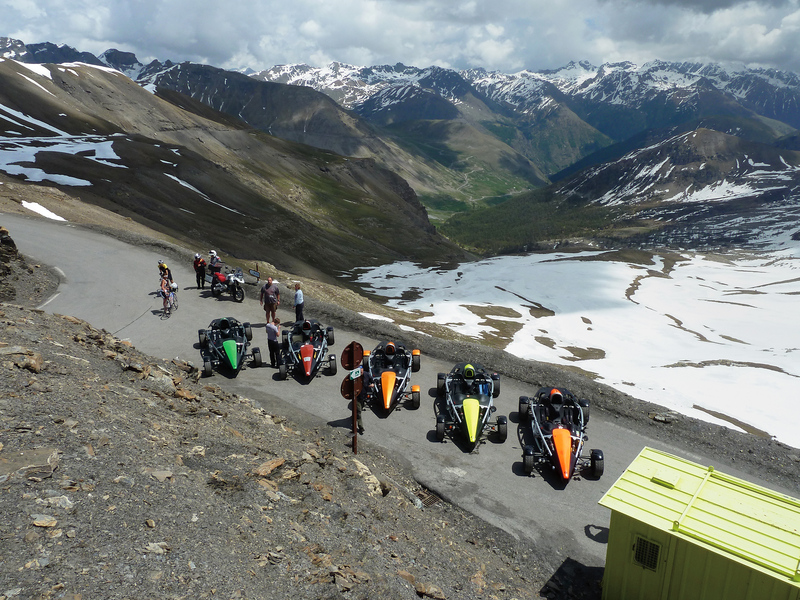 But of all the roads in France, there’s a handful that will take your breath away – the passes across the French Alps, which number some of the highest paved roads in Europe. They often make up a part of the Tour de France, under the ‘Hors Catégorie’ label, which translates as ‘bloody steep’. In an Atom, they are some of the most exciting and demanding roads you’ll ever encounter. We promise. Four star hotel, farmhouse or chateau? 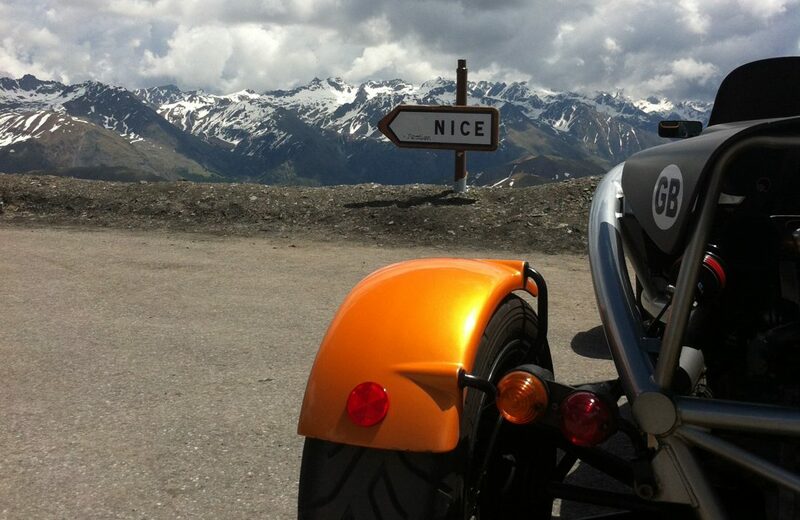 Driving an Atom across France or Switzerland can be enjoyable but tiring work and when you arrive at your destination you want to know that it meets a few essential criteria. If you roll in late in the evening, are they going to be able to feed you? If they can’t, is there somewhere nearby that you can go for dinner? You can book a shabby chateau in France for an inexpensive stop, a smart country pile that has a talented chef in-house, a timbered Swiss ski lodge with plenty of underground parking or Europe’s largest stone fort with fifty-four rooms over seven floors. Urban hotels can be just as pleasurable, but read up the reviews online before you book anything. They don’t have to work as hard for their business, so quality of service is more unpredictable. And you’ll definitely need to book, because a party of Atom owners turning up and simply asking for rooms is too much of a gamble. When darkness falls in the Swiss mountains you want to know you have a bed for the night, rather than driving around hoping that someone will take in your weary group. Parking is obviously important, because Ariels draw attention wherever they go. Ideally, you want a secure underground car park, but dedicated parking out of sight of any main roads is just as good. We’ve never had any problems using a well-appointed hotel car park. Some venues actually welcome car and motorcycle clubs and go out of their way to attract their custom. Ariel Club owners have stayed in one or two and the patrons are always very excited to see us, which makes for a fine start to staying somewhere. If you’re on a long journey with multiple stops, you’ll probably change hotel every night, but most Ariel Club trips plan for two or three night stops in some regions. It means you can settle in for a while, you don’t have to drive the next day if you don’t want to and there’s always the opportunity to make some minor repairs or clean up the car if needed. We go to Europe to drive, of course, but not everyone wants to hoon around every single day and wide-eyed passengers need a breather occasionally, too. Tyre condition. Will they last the journey? Brake pads – are they ready for mountain pass pressure? Are you showing a GB-marked plate or GB sticker? 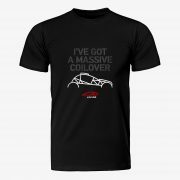 Breakdown cover is entirely up to you. We can cite two cases (in roughly 70,000 club miles abroad) where owners were glad they had cover. Obviously newer cars are less of a risk on a long run, but it’s reassuring to know that you have cover when you’re halfway up a mountain pass and something unfixable occurs. And a word on tyres for your trip – if you want to get the most out of this kind of driving, in the Atom, you’ll want road-legal track tyres on your car. Yes, it means you have to slow down a little in heavy rain, but the extra grip given by these tyres on a dry mountain pass far outweigh the wet weather downside. Pure road tyres will get you there and back, but they won’t be as much fun or inspire as much confidence when you’re hurling the car around. Touring an Ariel is about taking only what you need. And after the biblical storm that flooded Atoms on the inaugural Alpine trip of 2008, we discovered that we needed waterproof luggage. So let’s say ‘pack light’ but pack it in a waterproof holdall. It’s easy to dry off the clothes you’re wearing, but bloody difficult to dry ALL of your gear if it’s soaked whilst it’s sitting in your trip bag in the car. Most owners use OverBoard bags, but a good marine bag will do just as well. The Overboard 60 litre duffel bag fits neatly into the passenger footwell and is thoroughly waterproof. If you’re carrying a passenger you may want to go for a smaller bag, to allow more legroom. If you’re worried about security, such as when you go to pay for petrol, just secure your luggage to the frame with a sleeved bicycle combination lock – that way it can’t be lifted out of the car. Most drivers take a smaller waterproof bag in the cockpit for items like the essential paperwork, cameras, télépéage tags and so on. They’re easy to attach to the car and quickly accessed if you need something. 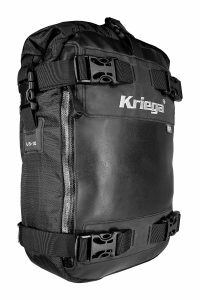 Kriega, who make super durable motorcycle luggage, make waterproof packs and rucksacks well suited to the Atom. Their US-10 DryBag being a proven piece of Atom touring kit. If you’re driving in rain, you’ll want fully waterproof outer layers, waterproof trousers (or over-trousers) and gloves, if you like to cover your hands. Pay special attention to your neck, cuffs and ankles – this is where wind or water will get in and turn a wet day into a miserable day. Most owners choose ski, cycle or motorcycle gear, but the deciding factor is does it fit properly with your arms and legs outstretched in the driver’s seat? Being warm, windproof and waterproof are essential features. Do spend some money on high quality clothing – it’ll last for ten years if it’s used purely for your Atom or Nomad. Helmets on these kind of long trips are also essential, but that’s not to say you’ll always wear one. On some days the sun will beat down and you’ll want to zip along the coast road with just a pair of wraparound sunglasses or goggles. Again, choose your headgear for the kind of driving you’re doing and how much risk you’re comfortable with. 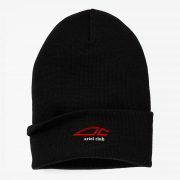 Atom helmets are a PhD thesis in themselves and lots of advice can be had on this website or the forum. Shoes are best kept lightweight and thin-soled, so that you can feel just how much brake or throttle you’re giving it as you thunder into another hairpin corner. It’s 2017, so most owners will be running satnavs in their cars. It means you can focus on the driving and less on the navigating, and if you’ve shared route files, you’ll know where the cars in front or behind are going. In horrible weather, a satnav can be your guiding light to the next hotel, so it’s money well invested. A word of warning though – take a good look at your route on a map before setting off. It gives you a mental picture of where you’re heading, which waypoints (towns or villages) you’re using and what to expect en route. When your satnav has a wobble or ties itself in knots, you can rely on your own memory of the route and which way you should be heading. Trust your common sense before a piece of software or you might end up in a ravine. Most routes on Ariel Club trips are verified over breakfast and if anyone wants to deviate from the route they can choose to do so. It’s also a good time to plan a lunch stop, in case the group gets split up, as often happens. And if your satnav battery icon starts to flash empty? Pull out the paper map from your waterproof bag. It’s a damn good back-up. Not all satnavs are hard wired into the car, so running out of juice is a real possibility. Because Ariel Club trips cover long distances, a lot of owners listen to music on the road, or at least put in some ear plugs so that they can still hear people in the bar that evening. The general trend has been to go for custom moulded earplugs from Ultimate Ears. They block out the majority of road and engine noise and give high quality sound when you’re turning up the music. Some are now using ingenious, noise-cancelling ear plugs from Bose that kill a good deal of the ambient noise from the road and engine. One more word on in-car technology – if you’re planning to use French autoroutes, a Liber-t tag device that allows you to pass through the toll booths without stopping is recommended. The charges are then billed to you at a later date. They keep the journey flowing and it means you don’t have to mess around trying to pay with cash, a card or asking your passenger to do so. Find about more about Liber-t tags on the UK SANEF website. Most owners keep the tag in their jacket pocket, in a waterproof bag in the car or under the dash. If you plan on using the motorways in Switzerland they take a simpler approach than the French. You’ll just need to purchase a vignette sticker for about £25 and put it somewhere visible on your vehicle. They can be bought from the Swiss Travel Centre. or at border crossings. If you plan to visit Switzerland in more than one vehicle in that year, don’t stick it on your car. Stick the pass onto a durable card that you can transfer between vehicles. There is probably one recurring worry that stops owners touring their Atoms and that’s the prospect of poor weather. A travelling group does get wet occasionally, but going between June and August means it’s rare. On an average 10 day trip, we’ve found that one day will be washed out, with the other nine being sunny or cloudy. So based on that fine empirical evidence, you have no excuse for not joining an expedition. Heck, on the Monaco Grand Prix Hoon of 2012 there was no wash-out day, so we escaped a soaking and the Pyrenees trip of 2016 saw 10 minutes of drizzly rain in two weeks driving. Besides, a little rain never hurt anyone, so get your car ready to go. There’s nothing like the prospect of a four star hotel waiting for you at the end of the day to keep the spirits up. This much driving nirvana, with a bunch of mates, is priceless. 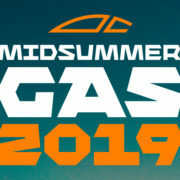 But as a general rule, expect French petrol to cost the same, Swiss petrol to cost less, good overnight accommodation to come in around £60-130 per night (shared, if there’s two of you, of course) and a Eurotunnel ticket to be about £140. A ferry crossing south to northern Spain is £400-500. It’s certainly not a budget holiday, but this is one of the best driving expeditions you’ll ever take on – what’s that worth? You’ve bought an unforgettable car. Now do the unforgettable trip. Once you’ve taken your car to northern Spain, southern France or up the Alps, you’ll want to return. Again and again. You’ll get more out of owning your Atom or Nomad and you’ll have had the kind of adventure that few people have the guts to take on. You can join in with any of the trips arranged by owners on the club forum, or better still, propose your own. It only takes two or three cars to make a group and there have been up to a dozen on some journeys. Don’t wait for someone else to propose a trip – suggest it and members will form a queue. You’ve bought a car that’s more than capable, so now it’s time to head out to some thrilling roads that have become part of motoring folklore. Get your petrol head on and plan that fantastic journey. Written by Steve Gibson in 2010. Edited occasionally to bring it up-to-date.